Lucena Brockway Adapts to Life in the Keweenaw Copper Mining Country of Lake Superior - History? Because it's Here! 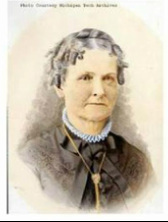 Lucena Brockway, her husband Daniel and their children were Nineteenth Century pioneer settlers in Copper Harbor and Eagle River, Michigan. Douglass Houghton, the father of Michigan copper mining was their friend and names of other early copper country pioneers like Benjamin Stannard, and John Senter dot the entries in the diaries that Lucena kept for over three decades. 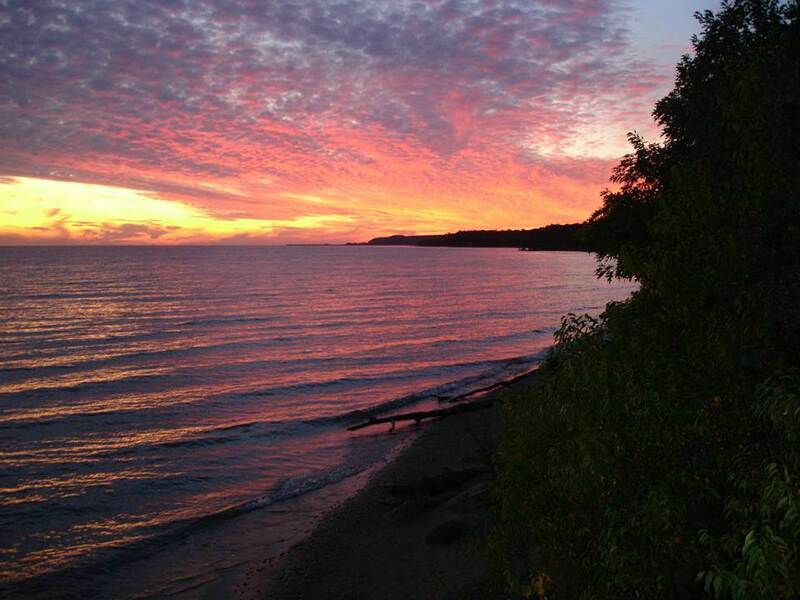 Lucena Brockway and her family and friends daily lived with the changing moods of Lake Superior and the air of romance and mystery hovering over its shores. The early pioneers respected the beauty and majesty of Lake Superior, but they also feared the power of the lake to brew deadly storms. Lucena and her family treated the Copper Harbor and Eagle River Lighthouses like old friends and they witnessed many maritime happenings since they lived on the shores of Lake Superior. For decades only fur trader’s canoes and small craft navigated Lake Superior because of the difficulty of transporting ships over the rapids in the St. Mary’s River which connects Lake Superior to the other four Great Lakes. The rapids drop about 21 feet and before the Soo Locks were built ships had to be portaged around the rapids. That meant cargos had to be unloaded onto wagons and then reloaded onto the boats that plied up and down the St. Mary’s River. According to Douglass Houghton, from 1815 to 1822, just one small schooner navigated Lake Superior. On March 20, 1815, British naval commander Henry Wolsey Bayfield received a lieutenant’s commission and during the summer of 1816, he helped Captain William Fitz William Owens survey several Canadian rivers and lakes. In June 1817, 22-year-old Bayfield was appointed the admiralty surveyor for North America, and as part of his duties surveyed Lakes Erie, Huron, and Superior. Early in 1823, Bayfield and his partner Midshipman Philip Edward Collins sailed for Lake Superior in a schooner called the Recovery, chartered from the Hudson’s Bay Company, with Commander Bayfield in charge. He discovered that it was quicker to use the two small boats for surveying He used the schooner Recovery mainly for transporting provisions. In three summers Bayfield and Collins voyaged around Lake Superior, exploring all of its bays and coastal islands. Their winter headquarters were in Fort William, now part of Thunder Bay, Ontario. In the fall of 1825, Bayfield returned to England and worked nearly two years to complete the charts of Lake Erie, Huron, and Superior. Douglass Houghton played an important part in Lucena Brockway’s life, both directly and indirectly. In 1841, Douglass Houghton issued his mineral survey report of Lake Superior and the 1842 the United States Government negotiated the Treaty of La Pointe with the Chippewa Nation which opened the region to exploration. In 1844, prospectors discovered copper and iron in the Upper Peninsula and the next year copper mining began in the Keweenaw Peninsula. The rush of people created a demand for ships to carry goods back and forth between the Upper Peninsula and the East Coast. On June 19, 1843, Daniel and his younger brother Alonzo who had been appointed his blacksmithing assistant, his wife Lucena and their two small daughters Charlotte and Delia, arrived at the portage at Sault Ste. Marie. Charles Carrier, employed as a farmer by the Indian Department, and his family met the Brockways at Sault Ste. Marie. For the next six weeks and three days, the Brockway and the Carrier families waited for a ship to take them to L’Anse. Finally, on August 4, 1843, the old brig John Jacob Astor pulled away from the Sault Ste. Marie dock carrying essential supplies for the isolated communities along the Lake Superior shore and the Brockway and the Carrier families among the impatient passengers bound for L’Anse. Dr. Douglass Houghton, Michigan State Geologist and his party traveled with them as far as Grand Island, about a half a mile from the mainland town of Munising, Michigan. Douglass Houghton had many discussions with Daniel and Lucena Brockway about the prospects in Keweenaw Copper country as they strolled the decks of the John Jacob Astor. At this point, the John Jacob Astor was more of a seasoned pioneer than the Brockways. The British Whig of August 15, 1845, mentioned the schooners that ferried people and supplies back and forth to the copper mines and copper towns that dotted the Keweenaw Peninsula. The newspaper named the schooners Swallow and Chippewa, but stated that the first American brig on Lake Superior was the 150 ton John Jacob Astor. The first American commercial ship to sail Lake Superior, the Astor brought many missionaries, miners, and pioneers to the Lake Superior Country. Captain Charles Stannard and Captain Benjamin Stannard who discovered Stannard Rock, took turns navigating the Astor. As they chatted with Douglass Houghton on the solid deck of the Astor, neither the Brockways nor Douglass Houghton had any doubt that the brig John Jacob Astor would carry Houghton and his crew safely to Grand Island and the Brockways and their party safely to L’Anse. The American Fur Trading company built the Astor in 1834, with her hull being cut in Black River Ohio in the winter of 1834. The schooner Bridget carried the hull to Lake Superior, and Oliver Newberry and Ramsay Crooks, her owners, assembled her at Sault Ste. Marie between May 1834 and August when she was launched. After ten years of hauling supplies to isolated Lake Superior ports, on September 21, 1844, the Astor landed supplies for the troops at Fort Wilkins at Copper Harbor. A Lake Superior gale arose and eventually blew the Astor on the rocks near the Fort Wilkins dock. Captain Benjamin Stannard made repeated attempts to free the Astor, but she remained wrecked there all winter. In the spring he managed to salvage her rigging and machinery, The absence of the Astor caused great hardships in the pioneer Lake Superior settlements the winter of 1844-1845. On May 1, 1846, the Brockway family – Daniel, Lucena and their three daughters Charlotte, Delia, and Sarah, and two Indians left L’Anse in an open canoe, bound for Copper Harbor. They arrived there safely on May 3, 1846. Over the next few decades the Brockways lived in Copper Harbor, and in 1853 operated the Phoenix House Hotel in Eagle River. Lucena Brockway mentions countless visits to Eagle River in her diary entries even after the Brockways had moved away. After the copper rush at the Cliff Mine in 1845, Eagle River grew into a thriving port with a dock, a road, stamp mills, warehouses, streets lined on each sides with boarding houses, saloons and miner’s homes. Eagle River became the shipping point for Cliff Mine copper and the jumping off spot for men and supplies to move into the copper country. It matched and eventually surpassed Copper Harbor for the title of the Keweenaw Peninsula’s biggest boom town. On September 28, 1850, Congress allocated $6,500 to build a lighthouse at Eagle River to mark the river entrance from Lake Superior. Construction of the lighthouse and keeper’s dwelling was completed in 1857. A stiff wind blew off the shore of Lake Superior when the steamer Ironsides arrived at Eagle River on Friday, November 5, 1864. The wind churned Lake Superior’s waters so fiercely that the Ironsides had to anchor on the outer reef instead of coming into the dock and send the passengers, mails, and light freight to the dock in a yawl. Postmaster, express agent, and jeweler of Eagle River William Siebold distributed the mail and then he learned that there was still some material for him left on the Ironsides. Even though the wind grew stronger and stronger and his friends tried to persuade him not to go out on Lake Superior, William decided he would row out to the Ironsides. He got small boat with a single oar and started to scull out to the Ironsides. William wasn’t a skilled oarsman and he had only one oar, so the wind and the Lake Superior waves over powered his small boat and carried him past the Ironsides out into the lake. William struggled desperately against the wind and the waves and shouted for help, but no one seemed to believe he was in real danger and no one rowed out to help him. Finally, people realized that William Siebold had drifted far past the harbor out into the Lake Superior. They approached Captain J.E. Turner of the Ironsides and asked him to search for William Siebold. Captain Turner agreed, but after one of the crew dropped a wrench and disabled an engine, Captain Turner reconsidered. He also noted that he had a short fuel supply and that the storm was getting worse, definitely not conditions for cruising around in Lake Superior on a dark and stormy night looking for a single man in a boat. Captain Turner weighed anchor and started for Copper Harbor. A crew of skilled boatmen from Eagle River rowed far out into the lake searching for William.. They battled the waves and shouted his name, but they didn’t find any trace of him or the small boat with one oar. For three years no one in Eagle River heard anything more from William Siebold. After failing to hear from William, his friends in Eagle River wrote to his friends in Germany informing them of his death and his Eagle River friends administered and settled his estate. Then on September 21, 1867, a story appeared in a Detroit newspaper and the same story appeared in the Portage Lake Michigan Mining Gazette on October 3, 1867. Gustave Diemel, the man who succeeded William Siebold as post master of Eagle River, claimed that he had received a letter from William Siebold. Written in a “strong, plain hand” and addressed to the Postmaster, Eagle River, Michigan, the letter was postmarked Detroit, September 21, 1867. In the letter William Siebold wrote that although he had escaped a watery grave, he had arrived on the North Shore of Lake Superior almost dead. He had seen the fires of the Saginaw Indians while he still floated on the lake and some of the Indians spied him and brought him to shore. William couldn’t walk for two weeks, but after that he made several efforts to reach Fort William and he finally succeeded. He wrote from Fort Abercrombie in Minnesota that with the help of the priest there, he hoped to be at home in Eagle River in two weeks. The newspaper stories speculated that the letter might be a hoax and one even said that maybe the same friends that had settled his estate to their benefit might be responsible, but one newspaper noted that William Siebold returned to Eagle River and resumed his jewelry business. Two of Lucena Brockway’s diary entries from Eagle River for the last part of 1866 mention the Ironsides and Lake Superior’s unpredictable weather. It’s morning. Scot and Sarah with their little babe Mary Lucena left on the steamer Ironsides to go to Colorado to visit their parents and the baby died in four days after arriving. A very beautiful day sun shone all day and it seemed like spring. No ice . Picked agates on the beach much like summer. References Havighurst, Walter. The Long Ships Passing. McMillan, 1942. Penrose, Laurie. A Traveler’s Guide to 116 Michigan Lighthouses. Penrose Publications, 2008. Roberts, Bruce. Lighthouses of Michigan: A Guidebook and Keepsake. Globe Pequot, 2005.